Its sad. Really sad. Because I love my Vibrams. I love everything about them. I love how they look – they are so caveman-chic that I can’t help but wear them with pride on the streets of Williamsburg, in Prospect Park, or at the gym. People ask me how I like them and I tell them in earnest that I love them. I love everything about them. I love how light-weight they are. They feel like air on my feet, so much so to the point where it feels like you’re running in nothing, on nothing. I love that I can easily throw them into a bag and not feel weighted down. There’s a pretty good argument for Vibrams as well. Christopher McDougall’s book Born to Run has probably had the largest effect on barefoot or Vibram running as he traveled to Central America to study and run with tribes that can run great distances, 20 miles and beyond, in nothing but a pair of sandals. I am so hooked to this idea. 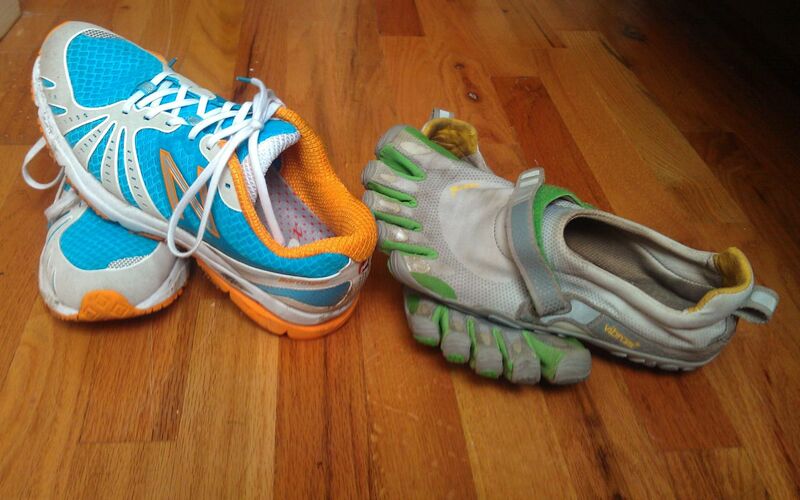 I tell everyone how much I want to try barefoot running and Vibrams. My friend Katie looks at me with disgust and says, “Are you crazy?”. Yes, yes I am. 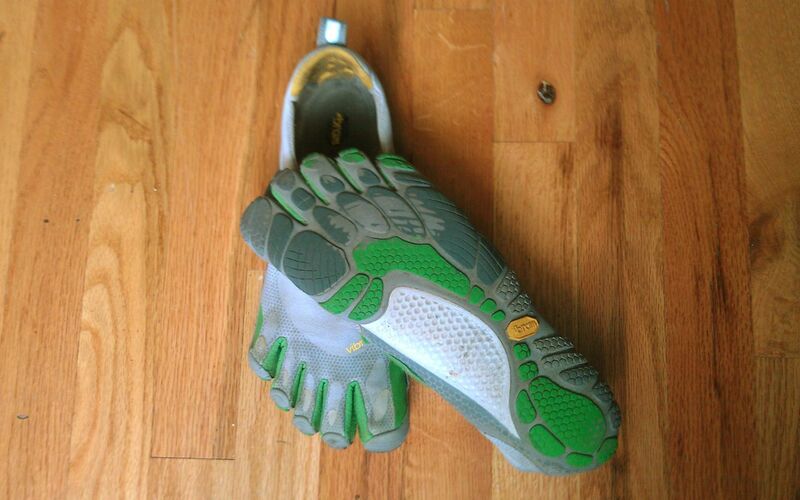 I purchase a pair of Vibrams and I am out the door in less than five minutes after the shoe box is open. I am in McCarren Park and I love, love, LOVE my Vibrams, except for one thing. I can’t run in them. Not that I can’t, per se. I can run in them for about a mile and then, all of a sudden – BAM! This pulsing pain in my right calf generating from deep down into my heel and traveling all the way up to the base of my knee. It’s a hot pain. It’s a prickly pain. I have been dealing with it for almost a year now, not willing to admit that I might have a problem, that I might need to hang them up. That I might not be the type of runner who can join the barefoot running craze. This saddens me to no end. But it must be done. In the year that I have been running in them, my running has turned absolutely dismal and I have no one and nothing to blame but the Vibrams. Aside from the extreme pain I feel when I run in them, Vibrams are not the best all-weather shoe. They are susceptible wet, icy, and cold weather, preventing me from running almost all winter and most of the fall and spring. But I love them! I can’t give them up. They have helped me in ways I could not have dreamt of. For example, ever since I have started running I have had knee problems, something that I think most runners suffer from sooner or later. Running in Vibrams basically makes it impossible to be a heel-striker (leading your step with your heel) and instead helps you to become a toe-striker (running more on the balls of your feet). Since I have been running in them, my knee problems have all but disappeared. The problem is now a new problem has moved in, and its even more painful than before. Now I know you’re thinking, “why don’t you just go buy a pair of regular running shoes again?”. Well I did. Two weeks ago. At Jack Rabbit Sports. (Which I like to call Mecca). And they’re beautiful. I really love them. These spring-colored New Balance kicks get me excited to run from the get-go. The woman who sold them to me, after watching my gait numerous times on the treadmill, said they were the perfect fit for me. But I feel defeated. I feel like I am cheating on my Vibrams. I miss them. In my new shoes I go back to heel striking because it feels normal, natural, like going back to smoking after just one drag, and just like that my knee problems have started to creep back. To their credit though, I was able to do my five-mile loop in Prospect Park after only a week in them. It was not pretty, mind you, but its a start. Still, I miss my Vibe’s. They are awesome and not wearing them feels weird, unnatural after so long. So on a warm morning when I am headed to the track to do some strength training, I throw the Vibrams on instead of the New Balance. I walk from my house to the track – no pain. I do a little half mile warm up – no pain. I go about my strength routine and my Vibrams only feel awesome. I am encouraged to try a few sprints in them – something I haven’t really been doing much of as of late – and they are amazing. I feel light and bouncy. I have a full 45 minute workout in them and it’s not until the walk home that I feel even a slight bit of discomfort, and certainly nothing like the searing pain I was feeling before. I feel elated.